We made it. It's Week 35, the final week (and day) of the MLS regular season. Every team plays Sunday at 4:30 p.m. ET except Real Salt Lake because there are an odd number of teams. If you're more than 20 points behind the leader in your respective league or playing for fun at this point because there's zero chance to win anything, it's the perfect week for a differential captain. Before we get there, it's important to figure out the playoff scenarios: everyone below Montreal in the Eastern Conference (NE, TOR, CHI, ORL) and the Galaxy in the Western (VAN, MIN, HOU, COL, SJ) have nothing to play for. Outside of New York City, Philadelphia and D.C. United, everyone else is in need of a win to better their playoff situations. The teams with the most desirable matchups are Columbus (v. MIN), Los Angeles (v. HOU), New York (v. ORL) and Seattle (v. SJ). The Crew aren't often on the captain list, but in a must-win game against Minnesota, who have allowed 43 goals and secured just five points on the road this season, there isn't a better matchup. Federico Higuain makes the most sense with 13 shots and 14 chances created in his last five starts, though his floor has often been around three or four fantasy points. I normally wouldn't consider him because of such a low floor, but in this situation where Columbus could win big, Higuain is at least in the conversation. Zlatan Ibrahimovic will undoubtedly be one of the top captains with an appearance on the score sheet in his last seven starts. Even better is that the Dynamo have allowed four goals in three of their last four road games. Either way, Ibra should be in every squad, with Romain Alessandrini close behind. The Galaxy are in need of three points to make the playoffs (ahead of inactive RSL). The Red Bulls still have a chance at the Supporters' Shield and face Orlando, the only team that may be worse than Minnesota on the road, getting outscored 9-0 in their last four trips. The Golden Boot is out of reach, but Bradley Wright-Phillips is a goal scorer and always wants to add to his total. He hasn't scored at home since July, though has played a full 90 in the last five matches and is a threat to score multiple goals, as he did against D.C. a couple weeks ago. 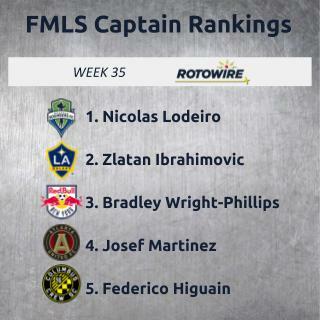 The Sounders still have a decent shot at a first-round bye, and that means Nicolas Lodeiro will be one of the most popular captains. He has at least 13 fantasy points in his last three starts, and since San Jose give up multiple goals in every road match, it's all but guaranteed that Lodeiro will be involved in one of them. If you want safety, Lodeiro is the clear pick for the armband. Montreal are in a must-win situation against a team out of the playoffs, but the Revs have played well at home this season so Ignacio Piatti won't be high on my list. Kansas City and LA FC may be in the most exciting match Sunday, but that also means I don't want to captain anyone from that game. D.C. are cruising, but they still have one road win all season, so for the first time in a while I'm not backing Luciano Acosta or Wayne Rooney for the armband. Dallas aren't closing the season well and I'm avoiding them against the Rapids. The same goes for David Villa and NYC FC, as they have little to play for against Philadelphia. The Timbers (at Vancouver) are in the best situation of teams on the road, but Diego Valeri hasn't done much lately. On the other end of that, Sebastian Blanco could be a great differential with 31 fantasy points in the last two matches. I'd say Toronto-Atlanta could be headed for 10 goals, but the Canadian team has just one goal in the last three matches. However, this is a perfect spot for Josef Martinez to cap off the regular season with another hat trick. The problem is that Miguel Almiron is hurt and Martinez hasn't scored in his last four starts.